Anyone scared about the distance can relax since I will list bus rides you can take instead of hiking the full distance if this is too far for you. Moreover this tour is also great for biking! Those who like to walk down and along river Elbe to the museum harbor Övelgönne and the start of the beautiful Elbe river promenade exit metro station Altona towards Museumstrasse. Those who prefer a bus ride down to the river and to the museum harbor please exit towards Paul-Nevermann-Platz and walk to the bus terminal to take bus no. 112 to Neumühlen/Övelgönne. The hikers or bikers should follow Museumstrasse and cross the light to get to the former emperor square nowadays called “Platz der Republik” (republic square). Stroll to the park towards the lovely white colored town hall of Altona. The town hall was constructed in 1898 as former main building of the neighborhoods central station before it became one of the most popular locations for civil weddings in the city. Maybe you are running into one on your way. Pass the building and cross the big intersection of Palmaille to enter the Altonaer Balkon (park). From the street you can already see the jaw dropping vantage point over river Elbe. The closer you walk towards the park’s edge the better it gets. 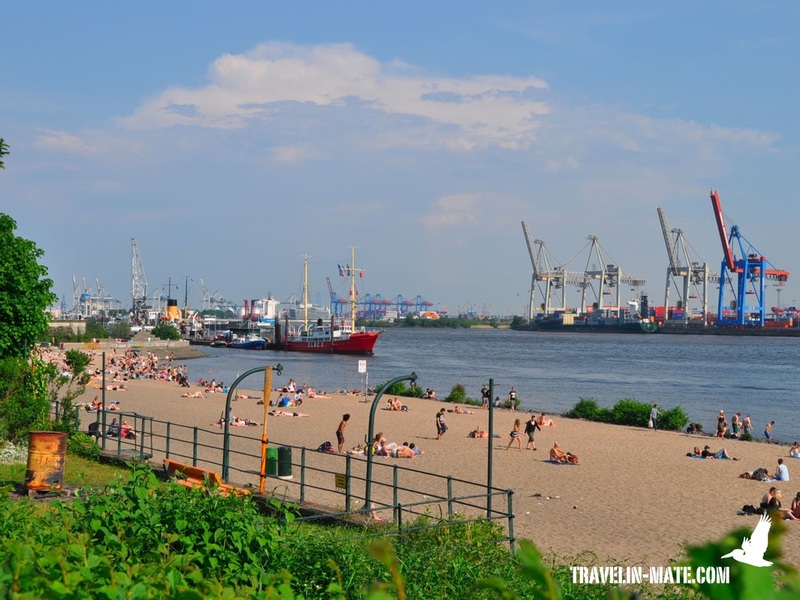 From here you can follow the little path to the right that guides you down to Elbstrasse where you continue along Neumühlen towards the museum harbor, its pier and the end of the road. Or you cross the small bridge to continue the stroll to the museum harbor along Schoppenhauerweg that guides you through Heine Park and Rosengarten, two parks above the street. The path ends at Lüdemanns Weg where you have to turn left and descend to the harbor. This is where you also arrive by taking bus 112. Walk onto the pier and have a look at the historic boats and ships. Back at the turning area and end of the road turn left to the little promenade that brings you to the beach. 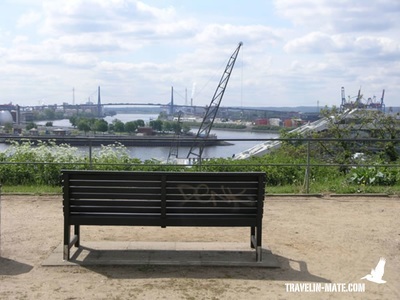 If you biked follow the promenade as well but make a right into Övelgönner Mühlenweg and an immediate left into Övelgönne to continue to Hans-Leip-Ufer (Elbe river promenade). Walking over the beach you come across “Strandperle” a popular beach bar in the city. In summer the bar is packed and surrounded by people that sunbath or BBQ. 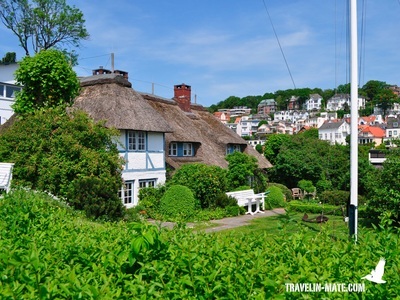 Have a refreshment before you walk up the stairwell to Övelgönne path that is lined with lovely small homes and gardens. 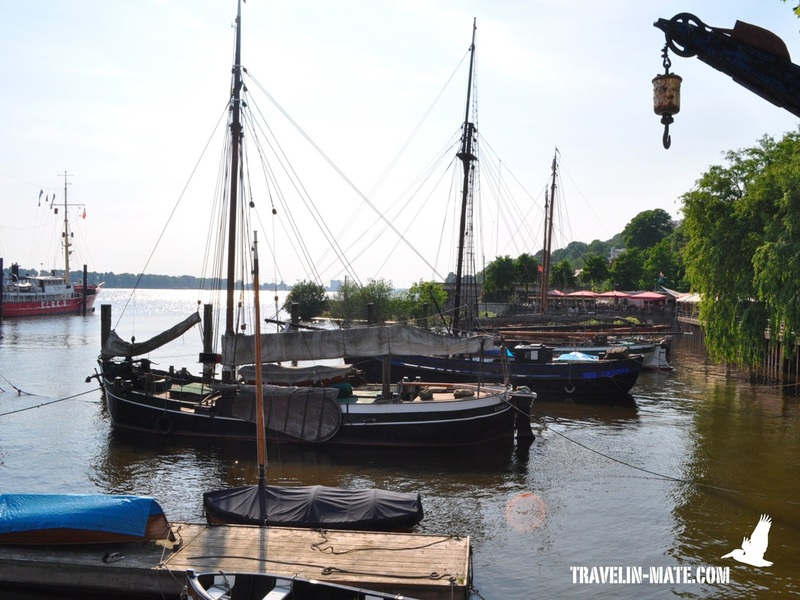 Continue to the left to get to the beginning of “Hans-Leip-Ufer” the river promenade that brings you to Blankenese. Those who prefer another bus ride, please walk also to the left and make a right into the steep path called “Himmelspforte” containing 126 steps. This stairwell gets you to Elbchaussee and the corner of Liebermannstrasse where you can take bus 36 to Blankenese. 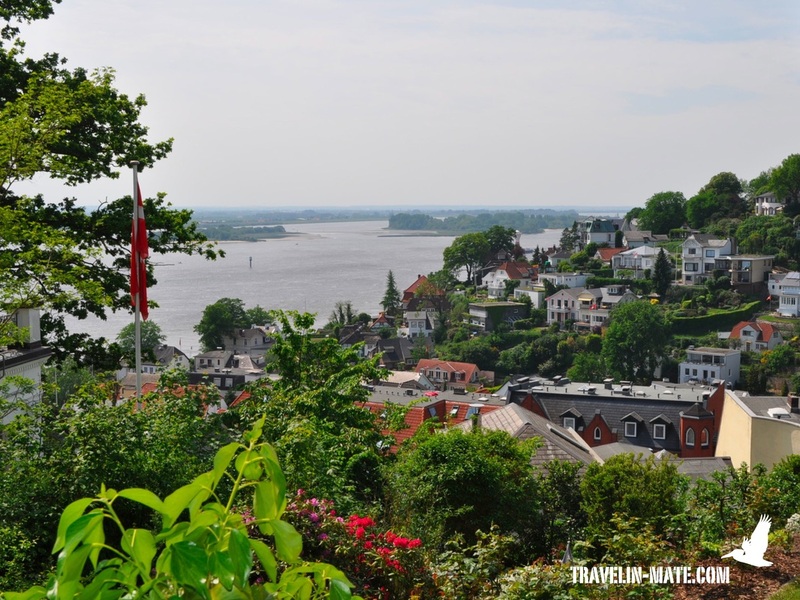 If you take the bus exit at metro station Blankenese and do the listed walk through Blankenese in the other direction. The first sight along Hans-Leib-Ufer is a huge boulder named “Alter Schwede” (old Swede). 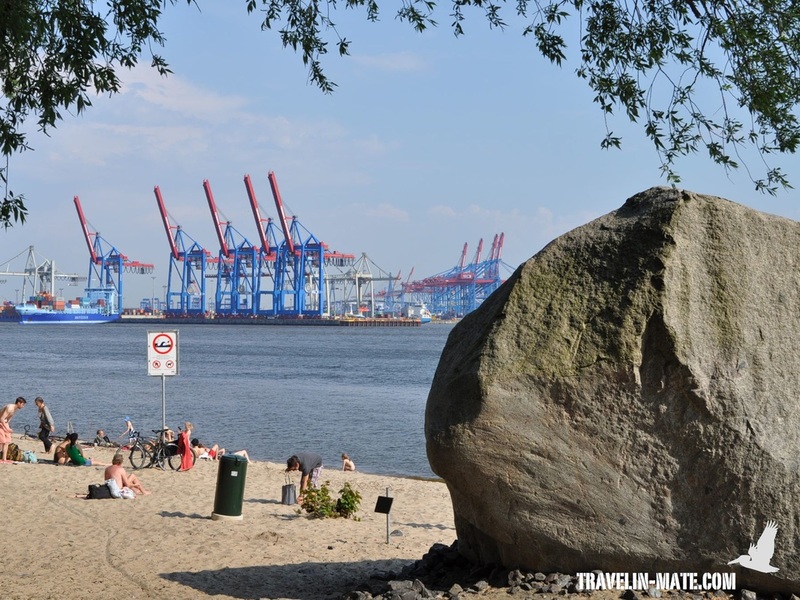 The name based on the boulder’s granite stone that originated in Sweden during ice age and was transported by inland ice along Elbe river to this location. This boulder is the oldest in Germany and has a weight of 217 tons. Follow the promenade and watch up the hill from time to time to catch a glimpse at the big mansions that line the shore to your right. On your way you will see several container vessels, boats, and maybe even cruise ships entering the harbor. 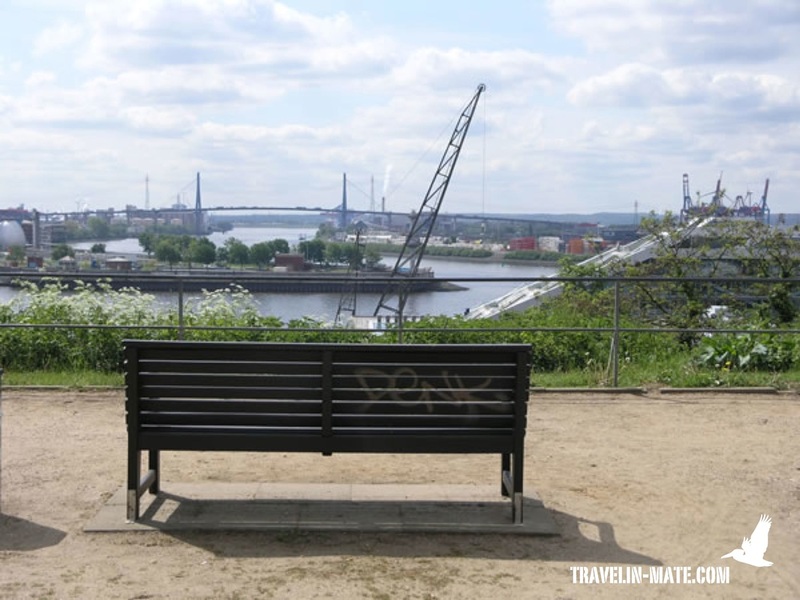 At the height of Hindenburgpark, a smaller park along the river you have an unrestricted view toward Finkenwerder church on the other riverside and further down towards the huge Airbus plant. Later you come along Teufelsbrück, the delta of Flottbek creek and Elbe river. It’s easy to recognize because you pass a small yacht harbor and ferry terminal. The park to the North is called Jenischpark, the oldest and largest English landscape park in Hamburg. Within the park lies the impressive Jenisch house, a neo-classical mansion that once was a summer residence and by today turned into an art museum. If you like to visit the mansion walk through park to the North or along Baron-Voght-Strasse up to the corner of Quellental. The mansion is to the right inside the park. Further along Hans-Leib-Ufer you come along the famous hotel Louis C. Jacob. The 5-star hotel is known for its beautiful patio that is framed by linden trees. From here you have a marvelous view over the river you shouldn’t miss. The easiest way from the path to the hotel goes over Jacobs Treppe a stairwell that ends next to the hotel. 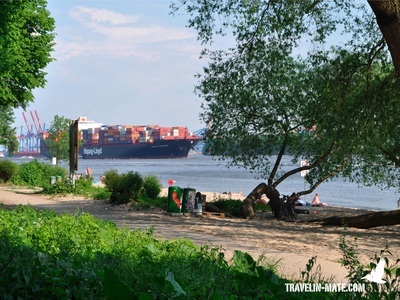 You almost made it and only have to pass another yacht harbor before you finally reach Strandweg, the promenade along Blankenese’s shore. The area uphill is packed with lovely properties and very expensive mansions. 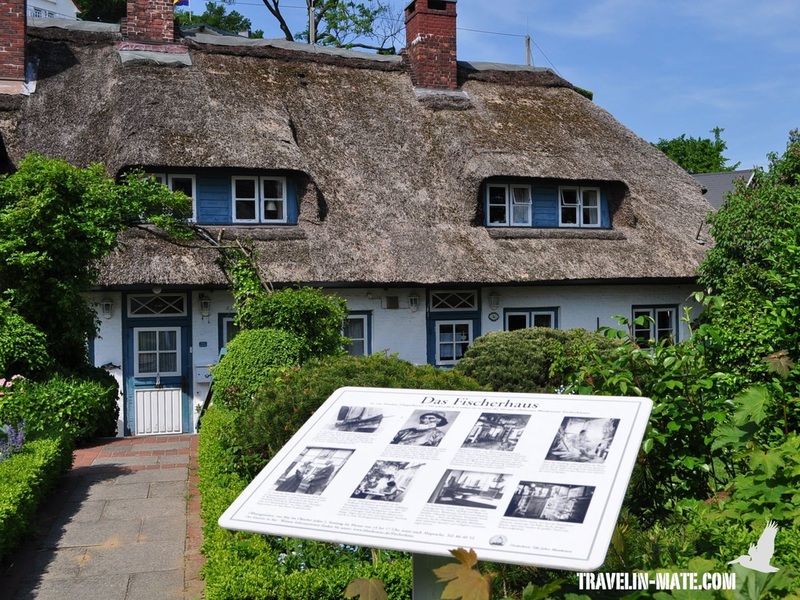 If you haven’t had a break at Louis C. Jacob you will find small restaurants and shacks offering fish rolls, traditional dishes or pies along Strandweg. 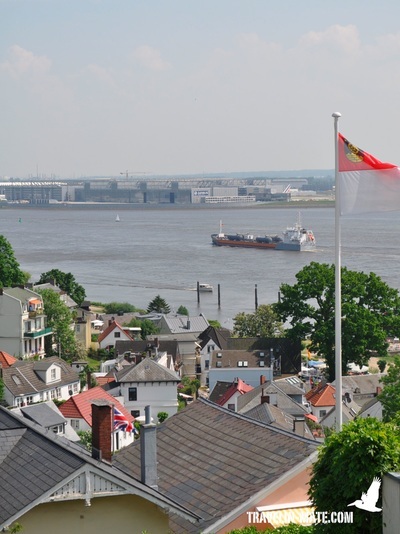 A nice location for a break is for example Strandhotel Blankenese located in a stately white mansion or the famous hotel Süllberg further up the hill. If you cannot decide don’t worry. 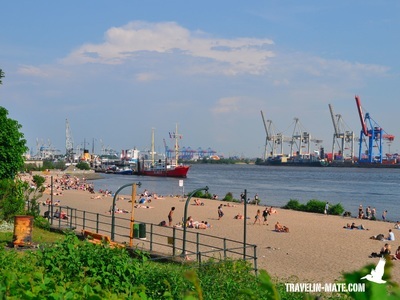 Have a snack at the shore and recover from the incline at the Süllberg’s beer garden later. By the way those of you with a bike should go off Blankeneser Hauptstrasse otherwise you have to carry your bike up the stairwells! The pedestrians follow Strandweg up to Müllers Treppe (stairs) that goes off to the right and gets you to Elbterrasse. From there follow Elbterrasse to the left and the corner of Süllbergterrasse. 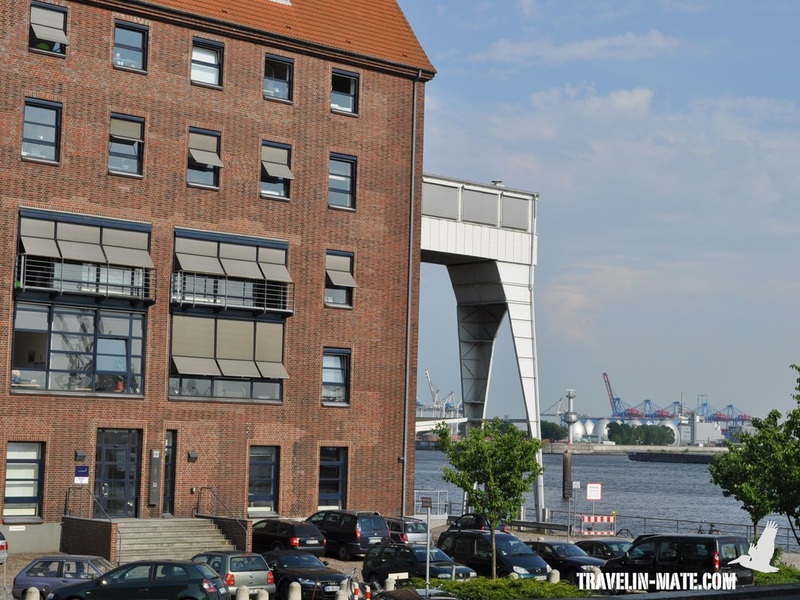 Pay attention to the building of Elbterrasse 4-6, a typical fisher house that was built in 1700. The house at Elbterrasse no. 2 is the oldest house in Blankenese and dates back to 1698. If you like to visit Hotel Süllberg with its beautiful beer garden overlooking the riverfront continue to the North (left) on Süllbergterrasse. The entrance to the property follows on the right. All others make a right into Süllbergterrasse and continue up to Bornholds Treppe. From there make a left into Hans-Lange-Strasse and a right into Blankeneser Hauptstrasse. Cross the street to enter Krögers Treppe (stairs) and turn left into Brandsweg. This is a short cut to the upper level of Blankeneser Hauptstrasse. 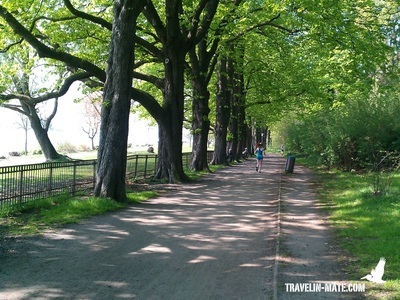 Continue to the right and make a left into Steiler Weg that brings you to Am Kiekeberg. Make a right and follow the street up to Blankeneser Bahnhofstrasse where you make a left to get to the metro station. At the corner of Mühlenberger Weg is the neo-gothic church of Blankenese that was built in 1898. From metro station Blankenese (S1 and S11) take the train back to Altona to spend the evening in Ottensen. 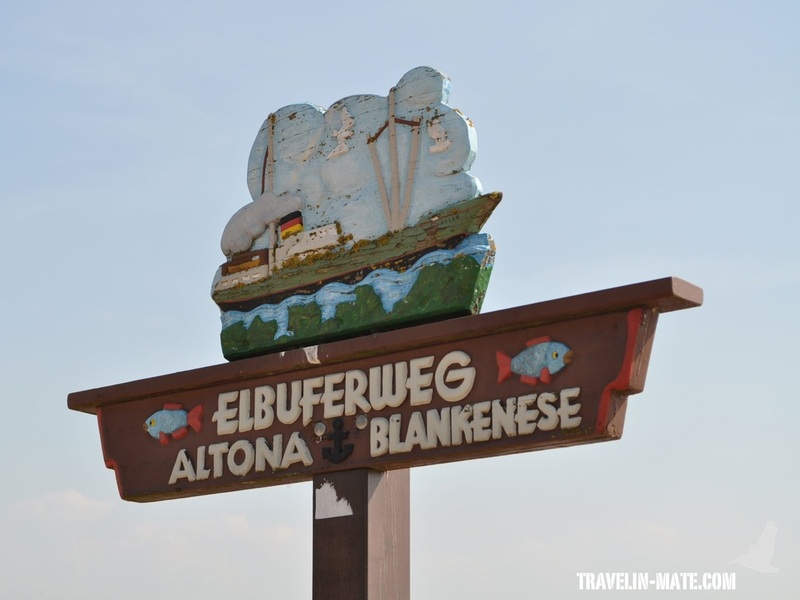 Back in Altona exit towards Ottenser Hauptstrasse and walk down the street. More bars and restaurants are located along Bahrenfelder Strasse and Alma Wartenberg Platz (square). A nice hang out with awesome pizza is for example Eisenstein at Friedensallee 9 (at Alma Wartenberg square) and the cool bar Imoto at Bahrenfelder Strasse 206. If you prefer Mediterranean fare head to Teufelsküche along Ottenser Hauptstrasse and have some drinks at Reh Bar next door. Further information about the restaurants and bars in Ottensen are listed under the restaurant section.